All pets are special and deserve a safe and comfortable home. Birds are no different, so invest in an EasyShed steel bird aviary for peace of mind. Replacing or purchasing a new home for your pet birds can be stressful because we always want what’s best for our pets. 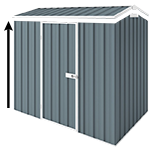 Well these EasyShed bird aviaries meet Australian standards which means you're investing in a structure designed to keep your birds safe and sheltered.